Here is a selection of Spanish property. Lovely spacious 4 bedroom, 2 bathroom townhouse. Walking distance to bars, restaurants and beach. Lovely spacious south facing 4 bedroom 2 bathroom townhouse set in a quiet residential area of lower Calahonda yet walking distance to bars, shops and beach side. The house is in its own gated secure community with communal pool and garden close by but benefits from its own large private garden. It has an excellent sized kitchen, 3 bedrooms on the 1st floor and an additional 4th room leading onto the large rooftop solarium. This house has been tastefully decorated. Bargain Properties selling Spanish property since 2002. Built 245m2 (living areas 145m2), Terrace 100m2, Plot size 125m2. 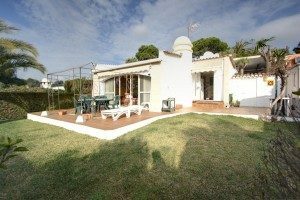 3 bedroom detached villa in small community with walking distance to all amenities in Calahonda, private garden and community pool. 3 bedroom detached Villa in small community within walking distance of all the amenities in Calahonda. South facing with garage and private garden, direct access to the community garden and pool. Spacious accommodation comprising of an entrance hallway, large split level lounge and dining room with open fireplace and direct access to the terrace and private garden. Master bedroom with fitted wardrobes and bathroom en suite with walk-in shower. 2 further bedrooms with fitted wardrobes sharing a further bathroom. Extensive terrace area and private lawned garden with steps to the large community pool. Marble floors, security glass and hot and cold air conditioning. Plot 450 m2 Built 130m2 + conservatory. Very spacious semi-rural villa on a large plot, 5 bedrooms, 3 bathrooms, 5-10 minutes drive to La Cala de Mijas and Fuengirola, partial sea views. Very spacious semi-rural villa situated a short distance from Mijas Golf and with 5 – 10 minutes drive of both La Cala and Fuengirola. The property stands in a large plot with swimming pool and gardens and provides spacious 5 bedroom accommodation on 3 levels. The accommodation comprises an entrance hallway with staircase leading down to the large living/dining room with open fireplace and access to a covered terrace and the gardens and pool. The kitchen is exceptionally large and including dining/breakfast space, extensively fitted with granite effect worktops built-in range style cooker, microwave, dishwasher and twin fridges. On the upper level there are two bedrooms including the master bedroom with walk-in dressing room and modern bathroom (Phillip Stark) en suite, 2nd bedroom with fitted wardrobes and bathroom en suite with large walk-in shower enclosure. On the top floor there are 3 further bedrooms and bathroom with spa bath. To the front of the house there is a car drive-in and the gardens are landscaped and well stocked. Large swimming pool. 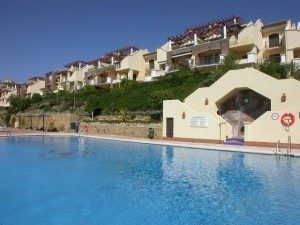 Stunning spacious 3 bedroom, 2 bathroom ground floor apartment, situated in the exclusive golf resort of Los Arqueros, 24h security. Open to offers for a quick sale! 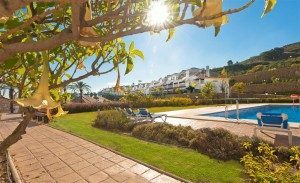 Stunning spacious 3 bedroom 2 bathroom ground floor apartment, quietly situated in the exclusive, private golf resort, Los Arqueros Golf, with easy road access, off the Ronda Road. The Los Arqueros urbanization features a 18-hole golf course with club house, 24-h security with on site security guards and -office. The complex features two large swimming pools + children’s pool. The property features an entrance hall, a combined living- & dining room, a kitchen with small breakfast bar and all appliances from Bosch, an adjacent utility room, three bedrooms and two bathrooms. Features include hot and cold air conditioning, alarm system, double glazing, cream marble floors, built-in wardrobes, satellite TV, etc. Garage parking space in the in the underground garage. Views: Open and virtually front line golf. Fantastic opportunity, 2 bedroom, 2 bathroom townhouse, front line golf including golf membership, 24h security. Exclusive development of luxury 2 bed townhouses ready to move in, situated alongside the 13th and 14th fairways of Campo America in La Cala Golf & Spa Resort, Spain´s largest Golf resort. From the properties you will enjoy spectacular view over 3 Golf courses toward the Mediterranean to the Mijas Mountain. The Property has private garden, underground private garage, storage room and the community with 24H security of the Resort, also has 2 swimming-pools surrounded by beautiful gardens. The property could be very easily turn into 3 bedroom – 3 bathroom townhouse. Immaculate 2 bedroom, 2 bathroom apartment, open garden and pool views, 24h security and direct access to the beach from urbanization. 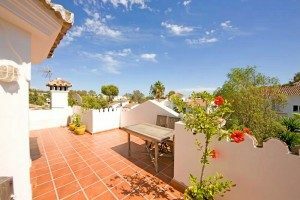 Immaculately presented second floor, south facing apartment with lovely views of the mature tropical gardens of Costalita. The property consists of a large sunny lounge-diner, a fitted kitchen with separate utility room, two bedrooms and two bathrooms. The master bedroom has an en-suite bathroom and both bathrooms have under-floor heating and there are electric blinds installed throughout the apartment, there is also a storeroom in the underground parking. The complex is completed gated, in addition there is patrolling 24 security in Costalita. Within the urbanization there is large communal swimming pool, beautifully maintained tropical gardens and direct access to the beach. Costalita offers beach bars, tennis, a spa hotel. Also very close there are some excellent golf courses, as well as a wide selection of supermarkets, bars and restaurants. Unique residence neighbouring the Royal palace, 7 bedrooms, 6 bathrooms. Great views, house is situated in a small cul de sac. Unique residence in a prestigious position on a small cul-de-sac road on The Golden Mile, neighbouring the royal palaces. The newly built property, designed by one of Spain´s leading architects, is presented in an immaculate condition and provides main living areas on ground level, consisting of a large reception room, a fabulous high ceiling lounge with large fireplace and floor to ceiling windows, a separate dining room, a fully equipped kitchen, a large TV room, two bedrooms, of which one is en-suite and a guest cloakroom. First floor provides a large gallery dividing two guest bedrooms en-suite from the master suite, featuring a pyramid shaped ceiling and with access to the open terrace with great sea views. The basement provides further two bedrooms, a staff quarters en-suite, a second kitchen, laundry area, garage for 2-3 cars, storage facilities, etc. The property is standing in very quiet and flat grounds with swimming pool, BBQ house and large driveway. Among the fixtures and fittings are underfloor heating throughout, double glazing, marble floors, etc. A rare opportunity in an excellent area on The Golden Mile. Built 1.000 sq. Terrace and porch 150 sq. Plot 2.000 sq. 7 bedrooms, 6 bathrooms, 1 guest toilet.